Mekong (Vientiane /// Laos), a photo by robdu91 on Flickr. Japan Trip 2012-53, a photo by robdu91 on Flickr. Japan Trip 2012-73, a photo by robdu91 on Flickr. 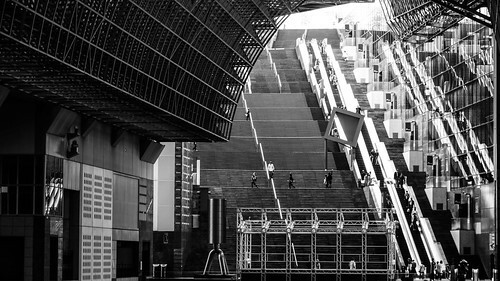 Kyoto Station, a photo by robdu91 on Flickr. Spider Web Brooklyn Bridge, a photo by robdu91 on Flickr. Kyoto Temple Shrine, a photo by robdu91 on Flickr. Mulu official guide, a photo by robdu91 on Flickr. Little India Shop, a photo by robdu91 on Flickr. New York, New York, a photo by robdu91 on Flickr. Himeji Castle, a photo by robdu91 on Flickr. Gunung Mulu National Park is famous for its limestone karst formations. Features include enormous caves, vast cave networks, rock pinnacles, cliffs and gorges. Gunung Mulu National Park has the largest known natural chamber or room - Sarawak Chamber, found in Gua Nasib Bagus. It is 2,300 feet (700 m) long, 1,300 feet (396 m) wide and at least 230 feet (70 m) high. It has been said that the chamber is so big that it could accommodate about 40 Boeing 747s, without overlapping their wings. The nearby Deer Cave was, for many years, considered the largest single cave passage in the world.